This is a rare street-to-water property on 80 feet of prime, Lake Washington waterfront on the north end of Mercer Island was sold in February. The home offers glorious views of the North & East, including those of the Cascade Mountains, the Bellevue skyline, and the picturesque, meandering shorelines of Medina, Bellevue and the North End of Mercer Island. The 3 bedroom, 2.5 bathroom 2,970 sf home is Just 10 minutes to Seattle with convenient freeway access! 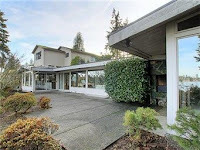 The home also has an extremely large, covered moorage. The home is outstanding and spacious, and a perfect remodeling opportunity. It also sits on two lots, ideal for investment and/or development. To see the full listing, follow this link. Click here to search more Mercer Island homes for sale.